Graduation is a special occasion, representing the culmination of all your hard work. It is one of the highlights of the College year and we look forward to welcoming you, together with your family and friends, to celebrate your success at our 2019 Graduation Ceremonies. What are the dates and times of the Ceremonies? The Graduation Ceremonies take place on Monday 08 July 2019 at 12pm and 3pm. Where are the Ceremonies held? Please arrive at 10:00am if you are attending the morning ceremony to ensure registration; robing and photography can be completed. Please arrive at 1.00pm if you are attending the afternoon ceremony to ensure registration; robing and photography can be completed. Your guests should arrive in time to be seated by 11.45am for the morning ceremony. The Ceremony will then commence at 12.00pm. We regret that there will be no entry to the auditorium once the Ceremony has started. Your guests should arrive in time to be seated by 2:45pm for the afternoon ceremony. The Ceremony will then commence at 3pm. We regret that there will be no entry to the auditorium once the Ceremony has started. How long does each Ceremony last? Is there any disabled parking at the Great Hall? Disabled parking for blue badge holders can only be booked by contacting graduation@nptcgroup.ac.uk. You will need to provide your registration number in order for a space to be reserved for you. Where do the Graduands sit in the Great Hall? Graduands sit in designated seats on the right-hand side of the auditorium. Seating will be arranged in course order and you will be allocated a seat number on the morning of the ceremony when you register. Can you arrange accessible seating for Graduands? Yes. Please specify your access requirements when registering your intention to attend your ceremony. The auditorium is situated on the first floor of the Great Hall, but lift access is available. Are guest seats reserved in the Great Hall? Can you arrange accessible seating for guests? Yes. Please specify your access requirements when requesting your guest tickets. Can we stand at the back of the Great Hall? Unfortunately, there is no standing room in the Great Hall. Can I book additional guest tickets? Each Graduand is automatically entitled to 2 tickets which will be available for collection when you register on the day of the ceremony. 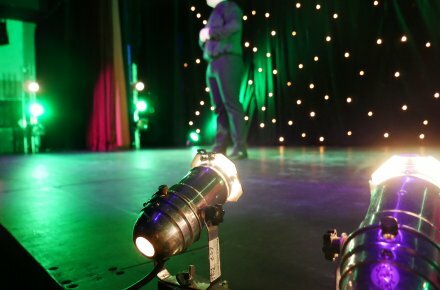 Requests for ALL tickets must be emailed to graduation@nptcgroup.ac.uk or by telephone on 01686 614222 by the end of Friday 14 June 2019. NPTC Group of Colleges will endeavour to meet any requests in excess of 2 tickets; however please note that this is not always possible. When can I expect to receive my extra guest tickets? We will inform you that you have been successful in receiving extra tickets after 24 June 2019. These will be available for collection when you register on the day of the ceremony. Do I have to wear the robes? I need to contact Ede & Ravenscroft about my robe order? Please visit www.edeandravenscroft.com or telephone +44 (0)1223 861854. What do I have to wear to the Ceremony? Anything smart and that you feel comfortable in – it is helpful to wear a shirt so that the hood of your outfit can be attached to a button. What colour are the robe and hood? Robes are black and the lining of the hood varies depending upon your award. You can collect your robes from the robing area in Room GH029 on the day of the ceremony. It will be clearly signposted. Representatives from Ede & Ravenscroft will be available to assist with robing. Do we have professional photos taken? Official photos are taken by and ordered through Ede & Ravenscroft. Please visit www.edeandravenscroft.com or telephone +44 (0)1223 861854. Where and when does official photography take place? Ede & Ravenscroft professional photographers will be available in Room GH001 after you have registered and robed. You may book your photograph prior to the event or pay on the day. To book your photograph(s), please call: +44 (0)1223 861854 or visit www.edeandravenscroft.com. Please arrive at least two hours before your ceremony if you are having official photographs taken. We ask that all guests be seated during the ceremony. However, photography is allowed from seated positions. Can we video the Ceremony? We ask that all guests be seated during the ceremony. However, filming is allowed from seated positions. When do I get my graduation certificate? Certificates for students graduating in July are posted by the Awarding Body as soon as they are available. Please ensure that your home address is up-to-date when registering your attendance. I have changed my name – which name will appear on my certificate? The name held on your student record at the time of enrolment is the name that will appear on your certificate. Are any refreshments served after the Ceremony? Following the Ceremony, graduates and guests will be able to purchase refreshments. This will provide an ideal opportunity for graduates to celebrate with family, friends and colleagues. I am unable to attend the Ceremony, can I attend next year? I cannot attend the Ceremony. What do I do? If you are unable to attend the Ceremony, for whatever reason, Ede and Ravenscroft will refund the payment you have made under the Hire Contract, provided they have received your notification of cancellation by email at least seven working days before the date of the Ceremony (27 June 2019). I have not registered my attendance – can I still attend the ceremony? Yes. Please contact us immediately by e-mail: graduation@nptcgroup.ac.uk or phone: 01686 614222. 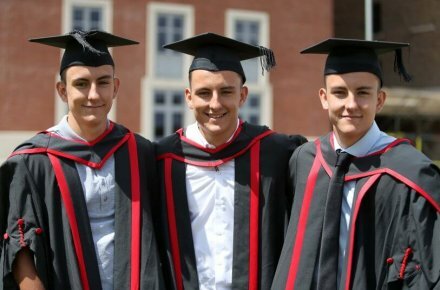 Triplets join nearly 200 graduating from NPTC Group of Colleges, with all three earning a Foundation Degree in Sports Coaching.